HALion 4 proves to be well worth the wait, though only time will tell if it can regain its status as a first-tier sampler. MegaTrig for expressive playing. FlexPhraser is a lot of fun! VST3.5 support. Mixer with extensive effects and routing. Sweet synthesis features. Bags of excellent library content. Automapping could be better. MegaTrig still has a learning curve. VST3.5 compatibility is a great selling point for users of Cubase (the only DAW so-far to embrace the platform). Think your keyboard is just for playing chords and melodies? Think again! HALion offers lots of ways to trigger articulations from incoming data. You can assign an external wave editor for the really heavy stuff, but HALion 4 has plenty of sample editing tools of its own. 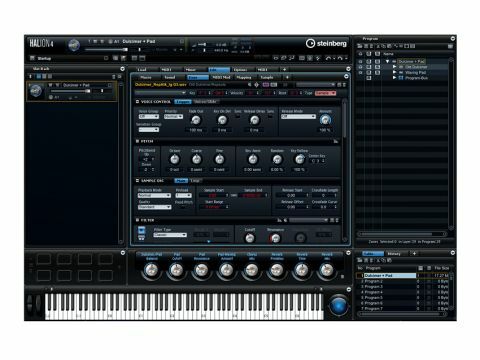 When Steinberg unleashed HALion back in 2001, it represented a breakthrough of sorts by offering a fully kitted-out plug-in sampler for DAW users. The company has trundled out a few significant updates since, but other products have sprinted ahead in terms of features, especially Native Instruments' Kontakt, which has become the de facto standard for third-party sample libraries. "Superb synths, orchestral sounds, electric guitar/bass, ethnic instruments, drums, and lots more." We got a taste of what Steinberg were cooking up for HALion 4 late last year when we looked at HALion Sonic, the sort of 'read-only' version of HALion. HALion Sonic is a powerful workstation instrument with an expansive sound library, much of which comes from Steinberg's parent company Yamaha. However, there will be users who prefer to be more involved in sound creation, and they will be thrilled with the deep sample manipulation and editing features of HALion 4 (well, assuming they're not already neck-deep in Kontakt). HALion 4 is a VST2/3 plug-in for Windows and a VST3/AU plug-in for OS X, with a standalone mode included. If you've already used HALion Sonic, much of what's on offer in HALion 4 will be familiar. It has all of HALion Sonic's sounds and more - there are superb synths, orchestral sounds, electric guitar/bass, ethnic instruments, drums, and lots more. It shares the same basic sample-playback engine, effects and an awesome synthesis engine. The latter offers three-oscillators, a suboscillator, ring modulation, noise generator, and multimode filtering with six different routing schemes, including morphing filters. The key difference is that HALion is designed to work with your own samples, so in our review we'll focus on those things that make HALion 4 a full-blown sampler. Naturally, there's a full complement of sample mapping, looping and editing tools. This is nothing new per se - previous HALions had loads of user-friendly sample mapping and editing tools, and they've been carried over into v4. HALion can still automap samples based on embedded root note or file name (though we have always found this a bit clunky and prefer to drag our samples directly into the mapper). It's what HALion 4 can do with the samples that makes the difference. New features enable more realistic performances and creative expression - for example, this version is VST 3.5-compatible, meaning it can take advantage of Note Expression and Quick Control integration. Using VST Expression maps, you can easily control articulations and performance styles. More interestingly, the Note Expression feature allows you to assign unique sets of controller data to each note when the patch is played polyphonically. It's a great selling point (well, for Cubase users, since that's the only DAW that currently supports VST3.5). Signal routing has been given a significant makeover. There's now a full mixer section and an unlimited number of busses for each Program and Layer. Each bus has level, mute, solo and pan controls and eight insert slots for the on-board effects. There's support for six channels of surround sound and up to 32 stereo outputs. Fortunately, all of this routing is pretty easy to manage, particularly if you're used to the mixer and routing options in Cubase or Nuendo. Comparisons to Kontakt are inevitable, but HALion is really a different sort of instrument. Kontakt is deeply customisable if you're savvy enough to take advantage of its scripting and interface options, but these aren't of much use to the casual user. HALion offers an alternative. Rather than providing a fully-customisable GUI, HALion 4 has a configurable workspace. You can't control the contents or visual appearance of each bit, but you can decide which ones you'd like to see and where they ought to go. Much has been made of Kontakt's scripting functions. Said functions enable the user to write their own code into the thing. For example, a script might take chord input and trigger samples in sequence to imitate the strumming of a guitar. It's powerful but rather heavy going. Scripting is deliberately omitted in HALion in favour of the simpler MegaTrig, a means by which many samples can be made to respond to the user's playing or programming, with no code required. HALion 4 offers plenty of tools for more creative and expressive performances. The FlexPhraser module is a fine example. Plucked from Yamaha's Motif series of keyboards, it generates musical phrases. These phrases can be as familiar as arpeggiator patterns or as inspiring as strummed guitar parts. As you'd expect, drum patterns and basslines are included among the preset phrases. We had great fun doubling up FlexPhraser modules on acoustic guitar patches. The results were realistic and inspiring - we'd never have come up with them on our own. One minor gripe is that the names of some of the phrases give little indication of what they are. For example, the drum phrases offer selections such as "X Over Rock A", which contains a hi-hat pattern, while "X Over Rock B" has a full, funky rhythm with multiple drums. Steinberg bigs up its MegaTrig system as an easier alternative to the scripting found in some other samplers. This is fair, though you still need to be reasonably technically minded to use it. You can program conditional operations based on input variables such as velocity, note number, count, playing speed and the like. You can choose functions from predefined conditions, and experienced coders will recognise the resulting expressions. If you know what you're doing, you can even roll your own expressions, too. Building massive multisampled patches is never going to be trivial, but Steinberg have done a good job of lightening the load, and more than that, they've given users the tools they need to get truly expressive performances from their patches. Frankly, we don't expect to see many Kontakt users ditching NI's sampler for HALion - that'd take one hell of a crossgrade offer. Nevertheless, HALion 4 is a terrific instrument that stands on its own merits. Sound designers and sample providers could find in HALion 4 a powerful ally for creativity. It's easily worth the asking price, especially for those who have yet to commit to a sampling platform.